In this video we demonstrate how to make tumbled glass using a rotary rock tumbler. 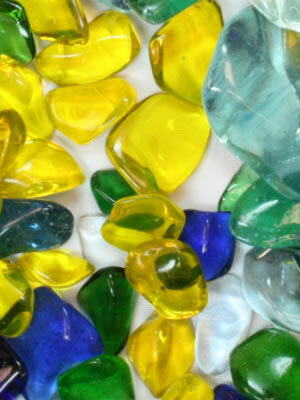 Our product will be very similar to the "beach glass" or "sea glass" that can be found along coastlines. We start with landscape glass that can be purchased at many home improvement and garden supply stores. After five days of tumbling in coarse grit it was converted into some nice nuggets of "frosted glass." And, after tumbling for several more days in medium grit, fine grit, and aluminum oxide polish we have some very gemmy pieces of polished glass. Lots of people use tumbled glass for ground cover in potted plants, aquarium gravel, making jewelry and a variety of other craft and home decor projects. Can I Tumble Glass in a Rock Tumbler? Lots of people have written to us asking if it is possible to tumble glass in a rock tumbler. The answer to that question is YES. In fact, many people who tumble rocks might have tumbled a natural glass without realizing it. Apache Tears and obsidian are volcanic rocks and natural volcanic glasses. Man-made glass can be tumbled using the same techniques used for polishing these natural glasses. If you have experience at tumbling rocks there are a few things that you should know before tumbling glass. First, glass is much softer than agate, japser and most other rocks that are typically processed in a rock tumbler. Glass has a hardness of between five and six on the Mohs Scale while agates and jaspers have a hardness of about seven. Glass is softer than agate. It will take less time to tumble. We generally reduce the seven-day tumbling time used when tumbling agates and jasper to a three-to-five day tumbling time for glass. Experiment to see what works best with the type of glass that you are tumbling. You can easily open the barrel, examine a few pieces, and if the shape/finish are not well developed you can reseal the barrel and continue tumbling. In addition to filling the barrel properly, it is important to have a range of particle sizes in the barrel. If your load consists mainly of large pieces of glass (greater than 3/4 inch in diameter), adding some small ceramic pellets to the load will fill the spaces between the glass particles, cushion the glass-to-glass impacts and increase the amount of grinding that occurs. We add a couple heaping tablespoons of ceramic pellets per pound of glass - or enough to fill most of the spaces between the pieces of glass. We use these pellets for both rotary tumblers and vibratory tumblers. If you don't have enough glass to fill the tumbler to the proper level, large ceramic pellets are a convenient way to bring the barrel up to the proper 2/3 full level. Tumble-polished glass. We started with landscape glass and followed the instructions used to tumble rocks. Glass is one of the more challenging materials to tumble. Its lack of toughness is the problem. If you want to get good results you must fill the tumbler barrel to the proper level and have plenty of small-size glass to fill the empty spaces between bigger pieces. If you don't have small pieces of glass you can use ceramic pellets. Just giving you another warning before you start your tumbler - we don't want you to open it to find that every piece of glass is chipped or bruised. Frosted Glass? ..OR.. Polished Glass? Some people who tumble glass want particles with a "frosted" surface - similar to the sea glass that they find at a beach. Others want a highly "polished" transparent glass with a gemmy appearance. The difference between these two is in the amount of processing done in the rock tumbler. Rough pieces of landscape glass ready for tumbling! 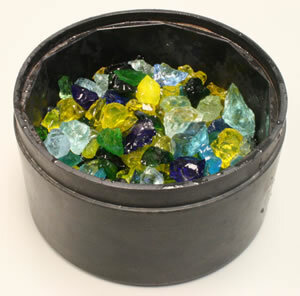 This is about four pounds of glass in a six pound tumbler barrel from our Lortone QT6 tumbler. We are going to add some small ceramic pellets to fill the spaces between the pieces of glass and bring the barrel up to 2/3 full. Watch the video above for more details. "Landscape glass" is a product of the glass recycling industry that is used as a ground cover in shrubbery and gardens. It is often sold at gardening supply and home improvement stores. If you want frosted glass simply run the glass through Step 1 of our rock tumbling instructions but instead of running the glass for seven days, stop the tumbler and check the glass after just four or five days. If the glass is not rounded to your satisfaction, clean the lid of the barrel and the rim where it seals, then close the barrel and run for a few more days. These photos summarize our landscape glass tumbling project. At the top is the landscape glass straight from the garden supply store. The center photo shows the "frosted glass nuggets" that we had after just five days of tumbling in 60/90 grit. 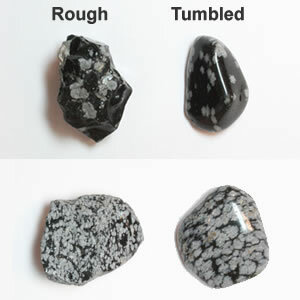 The bottom photo shows the gemmy pieces of tumbled glass that we had after the four-step tumbling process. If you want an even highter luster, then move on to Step 3 and Step 4 of our rock tumbling instructions. We run Step 3 for about three days and Step 4, the polishing step, for four to seven days. For polish we use TXP aluminum oxide. It has worked great on the glasses that we have tumbled. We have also used cerium oxide with nice results but it is a very expensive polish. A couple hours of burnishing usually improves the luster of tumbled glass. So, after the polishing step we tumble about two hours in water containing about one heaping tablespoon of shavings from a bar of Ivory soap per pound of glass. Should I Use Sand Instead of Grit? Some people use beach sand instead of silicon carbide grit when they tumble glass. They believe that this more closely mimics the actions of waves and currents at the beach for shaping their glass. If you want frosted glass you can get great results using sand, however, it will require more days of tumbling to produce nicely rounded glass pieces. This is because most beach sand is mainly composed of quartz, which has a hardness of 7, while silicon carbide grit has a hardness of 9. That means silicon carbide grit will wear the glass down much faster. What Type of Glass to Tumble? Lots of people think that broken bottle glass will be great for tumbling. They are almost always disappointed because bottle glass is usually so thin that it tumbles to nothing or pieces that are so thin that they are fragile and dangerous. To get nice pieces of tumbled glass you need to start with pieces of glass that are at least 1/4 inch thick. Recycling facilities sometimes sell "cullet" (the industry term for crushed glass). Some facilities sell it in mixed or separated colors. Be sure that you will get nice chunky pieces at least 1/4" thick. Glass manufacturing companies and glass repair shops can be sources of broken glass for tumbling. Stained glass shops can also be a place to obtain small pieces of colored glass that are left over from their work or too small to use in a project. These can be great for tumbling. Call these businesses in your town and ask - they might enjoy an opportunity to recycle their glass. Some garden supply stores sell landscaping glass in a variety of colors. This is often a by-product of the glass recycling industry. It can be successfully tumbled if the chunks of glass are not heavily fractured. Watch our video at the top of this page - we show you how we tumbled a batch of landscape glass. These are pieces of snowflake obsidian, a volcanic rock that is a natural glass. Rough pieces are on the left and tumble-polished pieces are on the right. Whatever source you use to obtain your glass, be careful! Glass is sharp and will cut you. Wear gloves and protective clothing. Safety glasses and a dust mask should always be worn when handling or sorting pieces of glass! Instead of breaking glass yourself, we recommend purchasing landscape glass or cullet. We generally have not had a problem with gas building up in the barrels of our tumblers. However, some types of glass will produce a small amount of gas while running in a tumbler. Because of this we always advise people to wear safety glasses when opening tumbler barrels to protect your eyes from possible spash or spatter of tumbling grit or rock mud. If your rubber barrel is bulging, open it carefully to allow the gas to escape. In cases of extreme gas build-up it can pop the lid off of a rotary rock tumbler barrel. That will spill the contents of the barrel all over your tumbler and the floor. It is not a fun mess to clean-up. To avoid problems you should check your tumbler barrel a couple times a day. If gas is building up in the barrel, it will cause the bottom of a rubber tumbler barrel to bulge. If you are familiar with the barrel, you can press on the bottom to see if it is soft or hard from a gas build-up. To avoid gas build-up, some people add a small amount of baking soda to the barrel. Steve Hart, author of Modern Rock Tumbling recommends adding 1/2 teaspoon of baking soda to the barrel to avoid gas problems. A little prevention can save a big mess. A couple times gas has popped the lid off of our Lot-o-Tumbler while it is running. That allowed the water to evaporate and the rock mud stiffened in the barrel causing a mess. We solved this problem by poking a tiny hole in the red lid of the Lot-o-Tumbler. Now the gas can escape through that hole before any pressure builds up. The problem with the lid popping off of a Lot-o-Tumbler is that the small amount of moisture in the barrel will evaporate and your glass will become welded together in the dry rock mud. The solution is simple! Poke a tiny hole in the red cap to allow the gas pressure to seep out. For more information about gas in a rock tumbler barrel, see our article titled: "Gas In the Rock Tumbler Barrel?" We really enjoy tumbling glass because it produces gemmy tumbled stones in beautiful transparent shapes. They look great in a necklace, and make brilliant vase fillers or attractive ground cover for potted plants and aquariums. You will find lots of great uses for your frosted or polished glass.